When Navy Captain John L. McCrea first brought home a new pet dog, his wife said, “Get that thing out of here.” Years later his daughter Annie Sullivan recalled, “my sister named the dog Victory but we all called him Vicky. 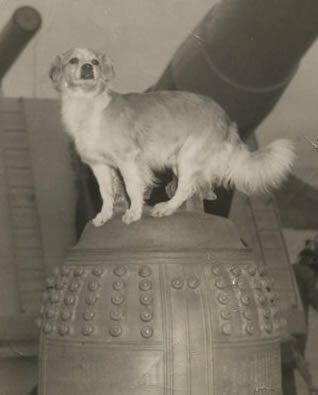 He was just a mutt.” That “mutt” would go on to sleep at the foot of President Franklin Roosevelt’s bed, share the Captain’s Wardroom with the great military leaders of World War II, log in over 205,000 miles on the Battleship Iowa, and be given full military honors when he finally left the ship. Vicky slept at the foot of the President’s bed in the Captain’s Cabin during Roosevelt’s 15-day stay onboard the IOWA. He also met frequent visitors to the cabin including the Joint Chiefs of Staff: General George C. Marshall, General Hap Arnold, Admiral William Leahy and Admiral Ernest J. King. Vicky joined the President and his guests in watching movies every night, but there is no record of Vicky’s favorite. While Roosevelt’s party met with Winston Churchill and Joseph Stalin in Tehran, Vicky and the Iowa took a quick trip from North Africa to Brazil and crossed the equator. Like all sailors, Vicky went through the tough initiation ceremony to become a Shellback. 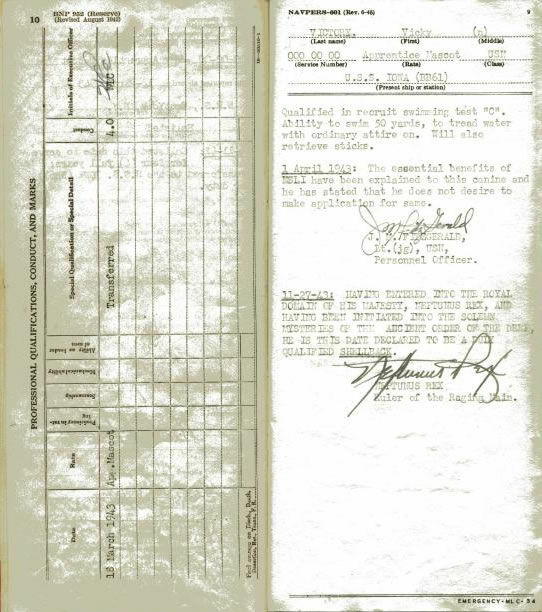 An entry in Vicky’s personnel record dated 27 November 1943 and signed by Neptunus Rex, Ruler of the Raging Main, declared Vicky to be a duly qualified Shellback. 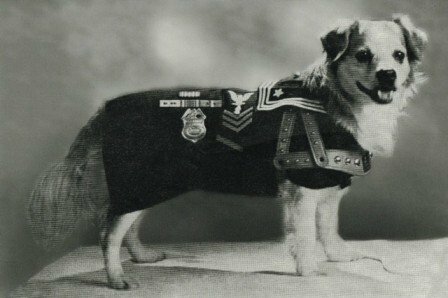 On 16 August 1945, Vicky was promoted to Mascot First Class due to his dedicated service. 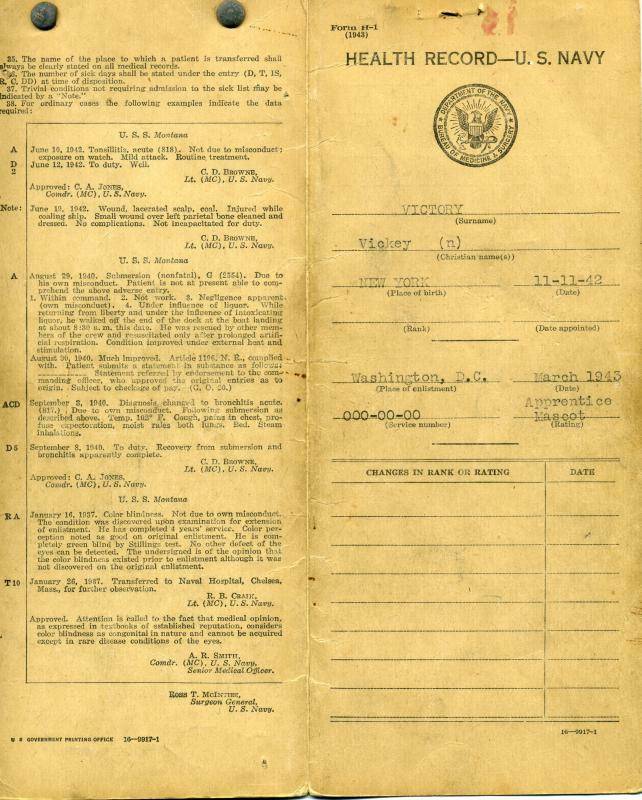 On or about 2 September 1945, Vicky and the other Iowa sailors greeted Admiral William “Bull” Halsey when he used the ship as his flagship for the formal surrender of the Japanese powers. There were only nine men in the history of our country to obtain a rank of five stars and Vicky met at least five of them – General George C. Marshall, General Hap Arnold, Admiral Leahy, Admiral King and Admiral Halsey. Staying aboard IOWA through late 1945, Vicky was part of the American occupation forces in Japan. On the way back across the Pacific in early 1946, Vicky was qualified to enter the Realm of the Golden Dragon for crossing the 180th Meridian. Like many fighting sailors, Vicky had some trouble adjusting to peacetime service. 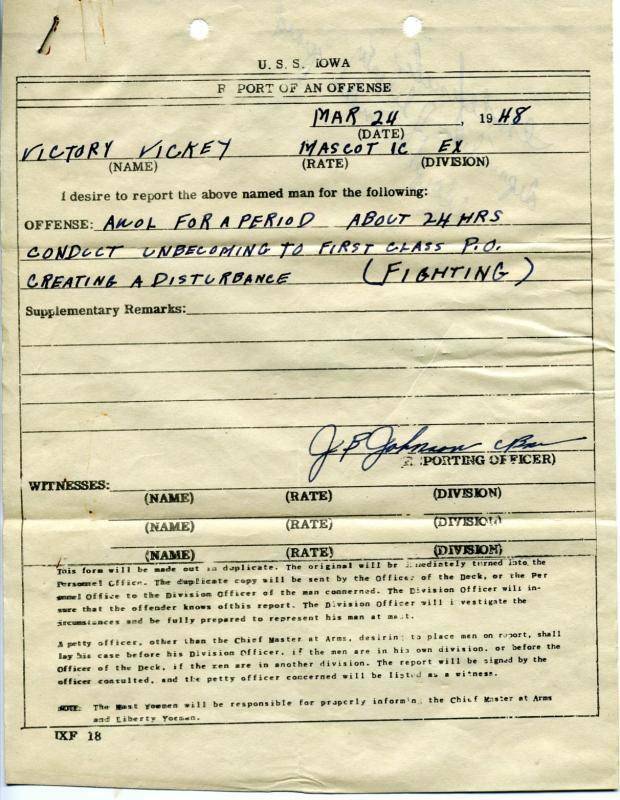 Later personnel entries included Captain’s Mast hearings for going AWOL (Absent Without Leave) and for fighting. At one point it became serious enough to be demoted two ranks to Mascot Third Class. As a member of the crew of the USS Iowa, you have through your devotion to duty ——– maintained a high moral standing toward your shipmates. 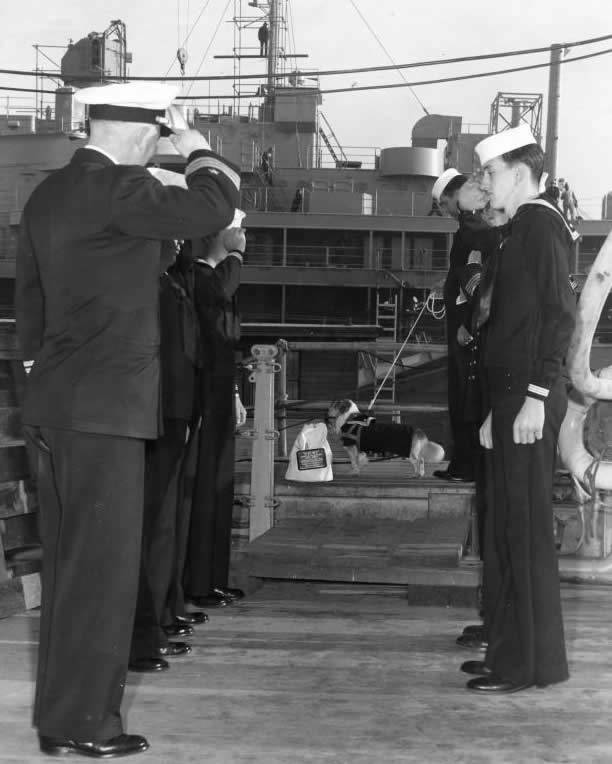 Vicky retired from the Navy after his service aboard USS Rupertus (DD 851) and was transferred to his new owner Mrs. Lynn Quiggle, family friends of the McCrea family and wife of a former IOWA shipmate.